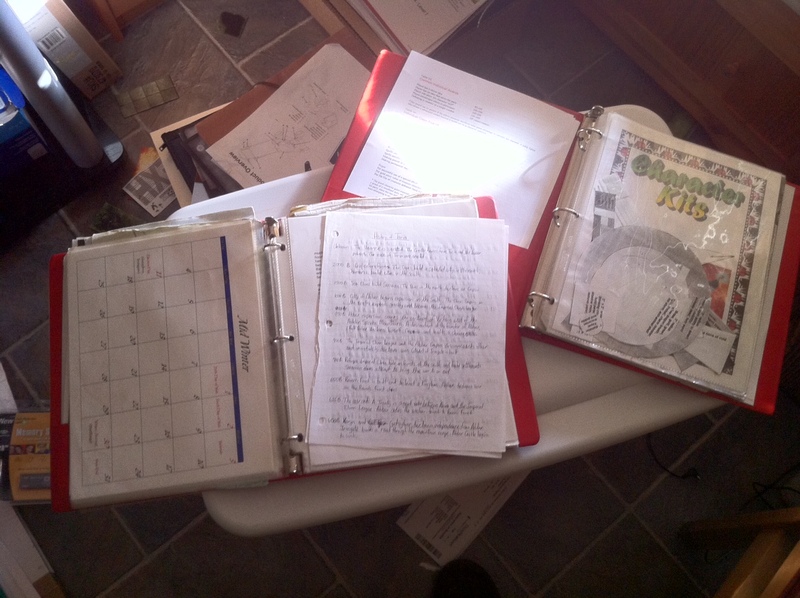 I thought it would be neat to have a page on my site where DM’s can share pictures and notes on their binders. I see a good binder as an essential part of the DM’s toolbox, and the thought came to me that it would be a fairly valuable resource if DM’s shared with each other what’s in their binders, showed each other their handouts, or just post good pictures so that newbie DM’s could get an idea of how to go about making their own and filling it with essential stuff. A popular article here at newbiedm.com is one I wrote some time ago on DM’s binders, so consider this an extension of that post. I look forward to seeing your submissions. And keep in mind, this isn’t limited to any edition or particular game, I want to see a variety of stuff here! Here’s what is ALWAYS present in mine. 2. Preprinted combat maps for any encounters I expect to happen. 5. Any magic item handouts I’ve got hidden in the world or want to give out for that night. 6. My Condition and status cards that I hand out to people who are unfamiliar with how 4E conditions work. 7. My awesome cards which is a reward system for great RP and interesting combat actions etc. Currently my DM ‘Binder’ is an iPad and small notebook. Just about any tablet will be able to do what I’ve outlined below. It took me awhile to warm up to the idea and find the right tools, but I do believe this is the future of GM tools. The notebook is mainly for brainstorming plots, NPCs and encounters. I find that pen and paper are great for quick notes and jotting down ideas. I regularly flip through them to remind myself of some idea I had weeks or even months ago. The iPad is what goes with me to gaming sessions and often it is all I need to bring beyond mini’s and a playing surface. 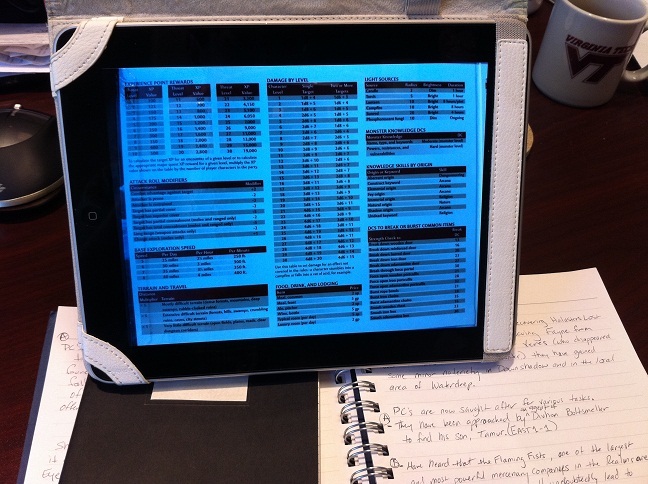 The notebook ideas are then fleshed out using Evernote on my PC and iPad. 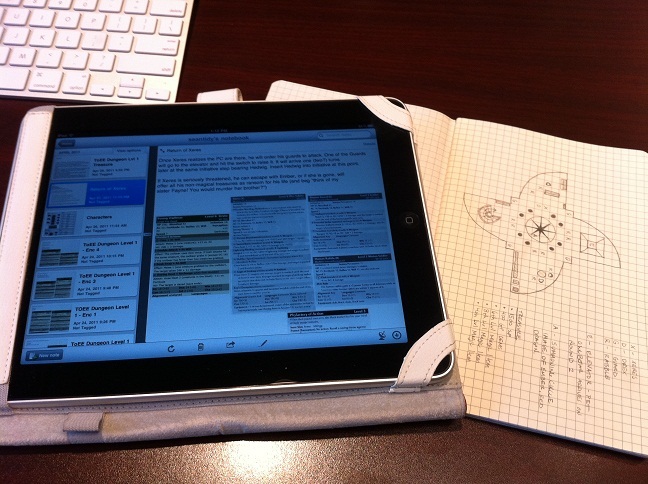 Evernote is a note taking and synching application. In my case it is installed on my iphone, ipad, PC and laptop. This allows me make updates or check notes anywhere. I use it in conjunction with the DDI Compendium, Monster Builder and the Win 7 Snipping Tool to cut out stat blocks and paste them into my notes, no formatting required. I’ve also snipped the stats and skill cards that come with the DDI Character Builder tool and paste them into my notes for easy reference of PC information. 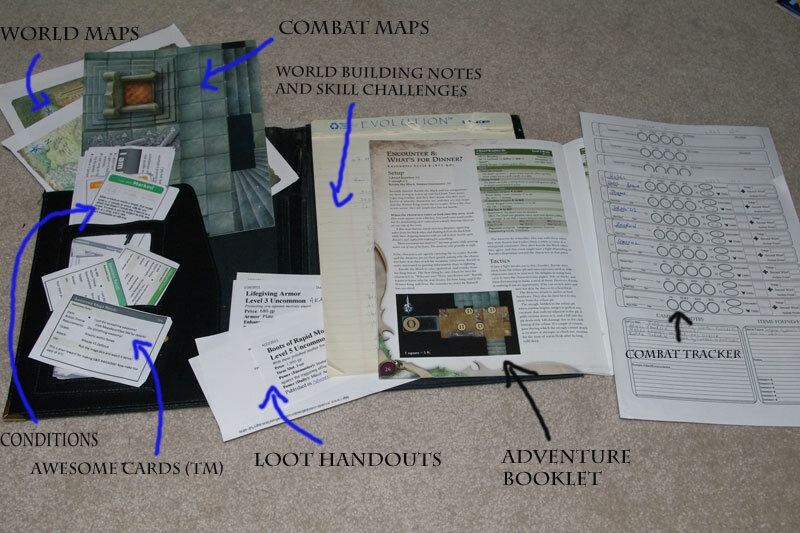 The iPad has also been adept at replacing various DM tools such as the DM screen, initiative tracking, dice, and physical books. I took a picture of each section of the DM Screen and loaded the pictures onto the iPad. I can now reference important information quickly and easily without having to reach over the screen. I use the free Initiative Tracker app by lvl99games for tracking init and status effects. And while rolling physical dice is still preferred, there is no denying the efficiency boost from pre-programming To Hit rolls and Damage expressions for large encounters. It really speeds up the DM side of combat, freeing up more time for thinking tactically. While I still have physical books, I definately don’t want to have to lug them around with me every time I head out to game. Game rules and adventures in PDF format are fantastic on the iPad (and Android tablets I’ve seen) and referring to them during a game is very easy when they are searchable and have good bookmarking. Finally, Since it often takes two lunch sessions to finish a combat encounter using a tablet or mobile device with a camera to take pictures of dungeon tile layouts, or the current status of an encounter is very handy. I can synch or snip those pictures right into my notes for next session. So this is what currently works for me and my game. I’m always on the lookout for new tools, apps and tips to make my DMing life easier. If I find something particularly useful, I’ll mention it at twitter.com/DieMacher. These are from my days DMing AD&D 2nd edition. The one on the left has all the notes from my homebrew world. You can see the calendar I worked up and some brief handwritten timelines. The second binder was more general information with printouts of house & optional rules in use, and photocopies of useful Dragon magazine articles for quick reference like spell reagent prices. There are also spell effect templates, character sheets, and blank paper. Hey Newbie, I wanted to give you a look at my “binder”. One disclaimer: I’ve only run 2 sessions, so this setup is in flux. So far it’s worked really well for me. The only thing I have that is similar to a binder is a little 2 pocket folder. This is where I keep any papers that I may need. Basically, my printed adventure, maps, and any handouts for my players. Also, you’ll see some small Post-It flags that I use for condition markers. They work really well with the Monster Vault style tokens. I don’t have any minis, so I’m not sure how the flags would work with them. That’s pretty much it for hardcopy items other than source books. My notes all stay in Evernote. I have it installed on every computing device I own that it’s available for. It’s really convenient on my iPod, because it lets me capture ideas as soon as they hit me. I keep 2 D&D related notebooks, one for general D&D notes, and one specifically related to my campaign. Finally, to run combat I use an awesome program I found called inCombat 4e. It allows you to import files from both the Character Builder and the offline Monster Builder. Once you import those files it will auto-populate names, defenses, initative modifiers, etc. Also, for imported monsters it will pull in the full stat block. That gives you all attacks, traits, auras. It keeps me from have to flip around a bunch of pages to look up a monster’s attack. You can auto roll initative for all you monsters, and inCombat will keep track of turns, rounds, status, effects. Pretty much anything you can think of. For me inCombat is indispensible. Here’s a look at a basic setup. It gives you a good look at a monster’s stat block. I myself only have a Manila envelope at this time. I do however run/play using Fantasy Grounds 2 VTT and don’t need very much at my computer since it’s all on my hard drive. I tend to keep everything in my laptop and only print out what I need for each session… though I also tend to prefer the printed books to electronic versions or other online sources so perhaps creating a DM binder would help. My notes include descriptions of, and motivations for, important NPCs. A brief description of where they might be encountered. And, game-mechanical specs should the PCs choose to make it a combat encounter. 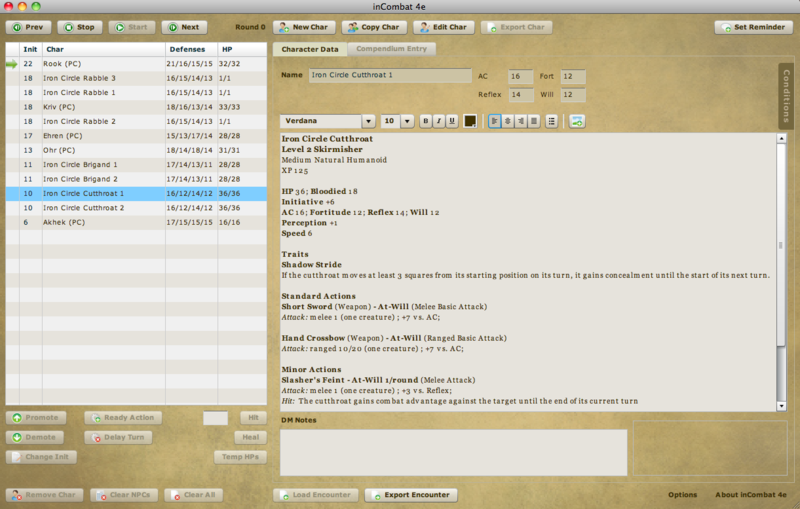 On my computer, I create a directory for each session and stash the game notes and encounter files for DnD 4e Combat Manager. This gives me a rough “chronology” to refer to when reconstructing what happened in a session. I try to take notes as we play, with varying degrees of success. My ongoing data-dump for the campaign is Obsidian Portal, but I try to keep a Word Doc “codex” that includes most, if not all, of that data in case the game wiki is not available for some reason. It sounds more organized than it is. Not all the data can be found in the places it “belongs”, and I often find snippets in odd places on my local drive. Thank Ioun for modern search functions! 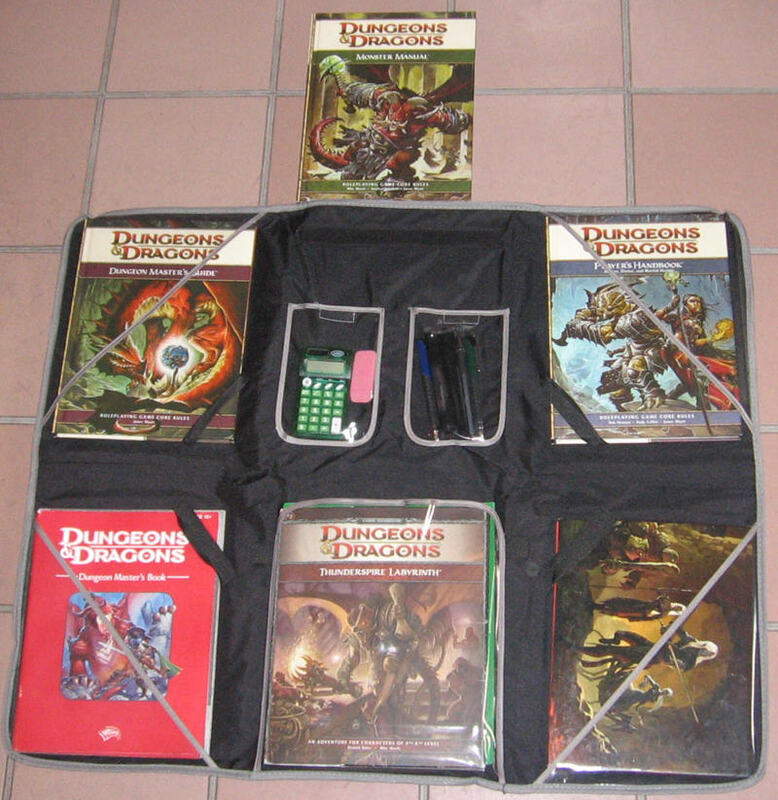 I’ve been hoping other DM’s would share how they organize their game materials, etc. Thanks for putting this up, Newbie. 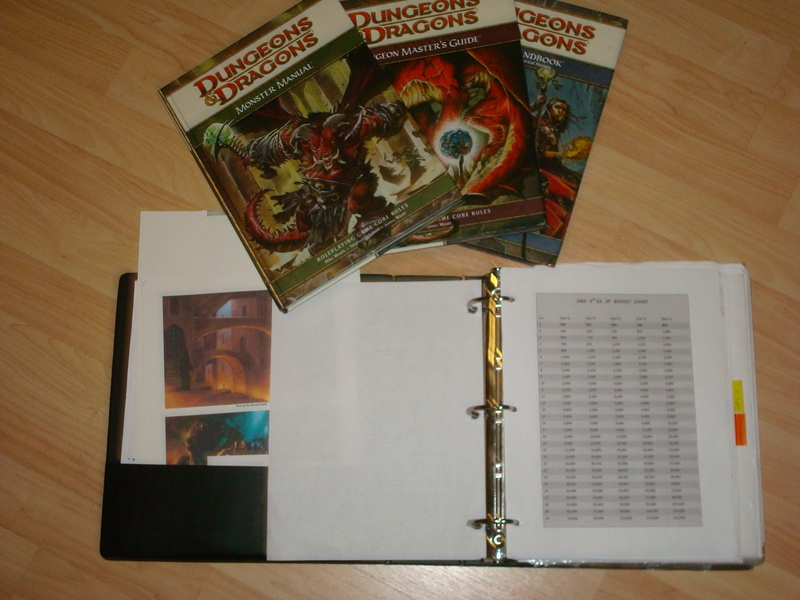 When I first started DMing, I had a binder with sheets of notes and monster printouts. I had graph paper covered in maps. Lists of phrases certain NPCs would say to provide a little flavor to key characters. Over time that changed to a few pages of monster stats or the basic outline of a skill challenge. That’s it. Maybe a paragraph of “flavor text” that I would read if something really called for it, otherwise I would just wing it. Heck, there were plenty of times I’d ask my players to “just draw a map of huge library, I’m going to run to get a beer. Anyone want one?” and just tweak what they’d come up with after the fact. I found that if I bogged myself down with many notes or maps or whatever, I would spend too much time looking through that stuff. Now, granted, my experience doing that was with a homemade adventure. If I ran a published adventure, I’d probably want at least the notes from that. I now use a combination laptop, iPad, and binder. As a world builder I need access to a lot of our own internal notes, images, etc. so a laptop is critical. I also use Map Tools to design the battle maps ahead of time and then use a projector at our gaming table. I also vary that up by projecting images for appropriate scenes and playing music. For our Shadowlands games, we try to make them as much of an experience as possible, so there ends up being a lot of tech! Are you a D&D insider? If you are, there are literally HUNDREDS of really nice grid based maps that you can download. Gimp is not the easiest program to use, but if you can import those maps into gimp and crop them such that only 8×11 squares of the grid show up, you can easily print maps out. Usually, the maps will fit on 2-4 sheets of paper. Only problem is that ink can get expensive so make sure you put your settings on “high speed draft” printing as its usually good enough and will use half the ink. Also, you can try to use programs like this to generate maps. Not only will it generate good looking maps within your parameters, but it will also populate them with appropriately statted 4E monsters and some light descriptions. Check it out. It’s pretty awesome. 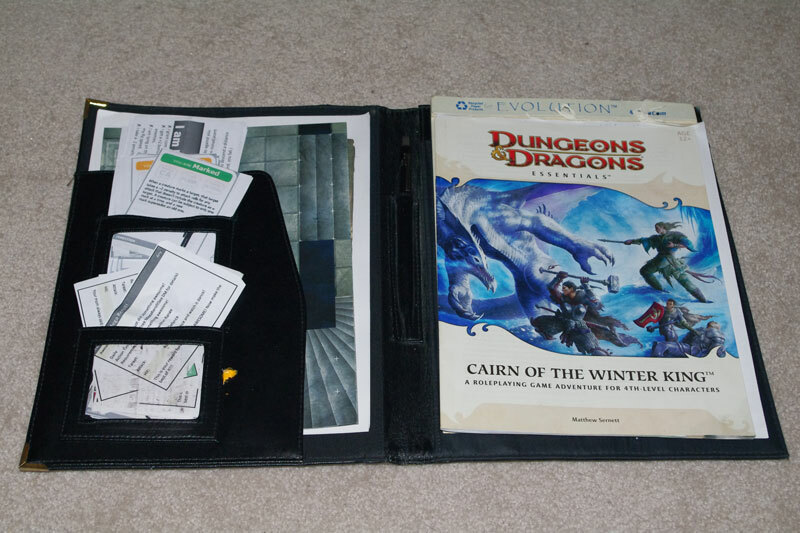 In the picture of “Michael Beacom’s” DM binder (1st pic) is a pic of a “Combat Tracker” print out. Where can I get myself a copy of that?!? as it looks really usefull. I’m trying to steer clear of as much digital stuff (aside from rules lookups in the online compendium, and character creation via DDI) at the gaming table. So I want to do as much via paper as possible, old’ish school style. I can hook you up. Just let me know where I can send a copy. I actually have several versions (players and monsters) a friend designed for me and that I’ve tweaked further. He based them off of the old 1E/Basic Character sheets I told him I really liked. So stylistically, they feel very old school. But I also had him make several changes that makes them work really well for modern 4E. I don’t know what I did before I had them to be honest. I would love a copy of that as well, being a REAL newbDM, as I have only run 2 sessions, I need all the help I can get to make sessions a fun experience for all. Email me at sirtanjedua at gmail dot com. This post is a great resource, I love to hear different ideas to get organized. I really want to take a look at this incombat 4e thing too. Thanks all! If at all possible I would like a copy of that combat tracker as well. I just started getting my binder together and this would really help a bunch. you can send the file to jasontex80 at hotmail dot com. I am curious to know what the 4e versions look like. 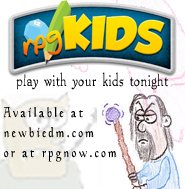 I must apploud this magical website of Roleplaying gamers! i love how we can all be able to share our knowledge! I will share what i normaly use… TBH im abit of a maximiser. they took spells from (descriptions of course) for quick reference if a player or ´DM gets confused..
dont you hate all the time wasted looking up rules? The Wonder File is awesome. I have ordered one for myself. Back in 2009 my players brought over a cake and beer to celebrate my DMG’s 20th birthday. I decided that given the age of my materials and methods that i should enter the modern era. I did the Laptop thing, the PDF thing, the Electronic dice thing, i even tried the new edition of the game thing (much bigger deal than it sounds). What i discovered is that all these new age things make the process so smooth and streamlined that it seldom even felt like the game I enjoyed so much. I have found that the term Pen and Paper Role playing is at the heart of the enjoyment for me. So now there is no computer, no tablets, no cell phones, no electronic devices more complex than watches. So My DMing binder has returned to the glory that it once was, Loose Leaves of paper bound in folders, envelopes, binders, or piles. Bags of dice, note cards, Post-its, Pens, Pencils all in an old cutlery box. Books in a bag. I don’t use a lot of the combat trackers, or spell trackers, or any other type of tracker, i find that anything like that can be easily put on scrap paper or written on loose leaf. so i don’t have much in the way of printed pages or computer printouts. As for electronic means being faster for in game research, i found it better to stick with my oldest house rule anyway. HOUSE RULE ONE: If we don’t know, make it up and go with it for now, take a note and look it up later, playing the game is more important that law abiding the books. 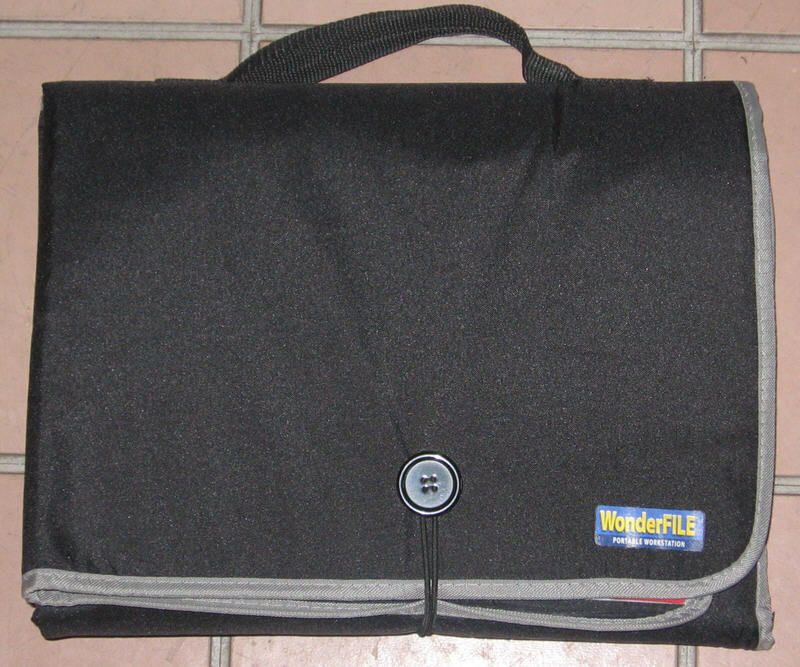 However after seeing the wonder file i believe i will gather my little collection together into that and at the very least it will make me more portable. This is stupid …….we all know binders are for putting women in. Aw, this was a very nice post. In thought I would like to put in writing like this moreover ?taking time and actual effort to make a very good article?however what can I say?I procrastinate alot and certainly not appear to get one thing done. Regular folder containing modules and maps. Separate folder for my own notes: Character plots, redesigned encounters (replacing module encounters), NPCs etc. that I have invented, treasure tables (made out of the player wish lists), printouts of rules or tables I use that aren’t on the DM screen, pre-rolled crib sheets with initiative and HP trackers for encounters, etc. Separate legal pad folio for XP tracking. I find it’s useful to use the real XP system because it forces me to record what the PCs did, for session summaries later. XP tracking on the folio. Notes on paper scraps related to the encounters, goals, skill challenges, etc. in the pocket. Tupperware boxes with minis or pogs for the encounters the PCs will face. A crate of books: I find AV, PHB, MV1, HotFL, HotFK, and DMK to be essential. Everything else can stay home or be the players’ responsibility (many of them use DDI or have PDFs or both). 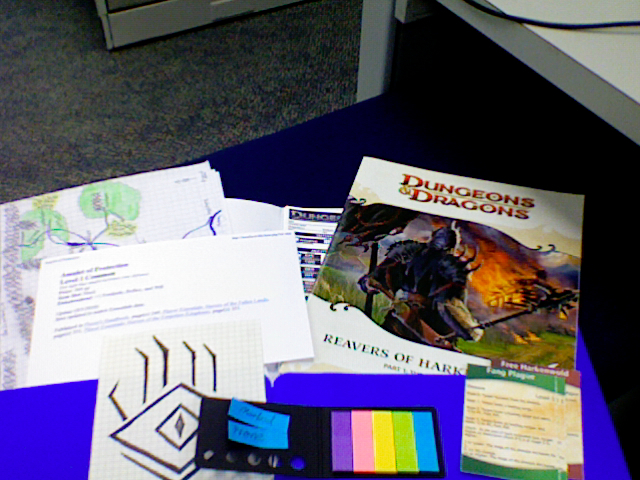 Also in the crate: Box of encounter maps, box of pogs (MV), box of dungeon tiles, roll of toolbox liner (for tiles), rolled up chessex battlemat. In my bag: iPad (ambient sounds from Youtube; notes in my Dropbox; access to the campaign Google Site, google image search for monster pics, etc. ); old business cards (to make initiative cards, pass notes, etc. ), multicolor post it flags to stick on initiative cards to remind me of status effects, wet erase markers, pencils, etc. Also: A 1″ scrapbooking punch. It makes 1″ circles out of those old business cards, which, with a quick sketch, creates custom pogs. Would love this combat tracker as well for 2e game if anyone sees this!!! May I have a copy of the combat trackers sent to me as well? I’m always on the lookout for something like that, that is not an App for a computer. This is SO helpful! Please keep them coming!!! I don’t have anyone around to play with. But my friend that lives in the next state over from me her friends are willing to let me join them via the internet via skype or discord to play d and d and my friend is helping me to create a character. So I can’t wait to play.